This barbecue tips page is getting too full! As I write more information and meet more people I pick up lots of handy tips, ideas and suggestions and this is the page where I share them. It's my reference point too. I guess I'm not alone in having a memory like a sieve so this is the place I come back to most often for a quick refresh. If using charcoal, be patient. After lighting the grill, give it 45 minutes before putting any food on. You're looking for the coals to be grey rather than black and all flames to have been extinguished. Don't be tempted to put food over charcoal as soon as the flames have subsided because as soon as any fat renders onto the the coals you'll have a flare up. It's the grey colour of the coals that should be your indicator that the fire is ready. They are impregnated with petroleum based fuel which smells and can taint your food. The charcoal burns too quickly partly because of the fuel impregnation but also because it's never the best quality. Briquettes are OK but a bit more difficult to light but once going provide excellent heat. The down side is that briquettes leave a cement residue when burnt which not only is more mess to clear up, this residue can also block airflow which is important when cooking with the lid on. Note:- No kamado manufacturer will recommend briquettes however I have found them perfectly acceptable for indirect cooking on a Weber kettle provided you don't place any briquettes directly over the bottom air holes. Lumpwood charcoal & a odour-less firelighter in my opinion and you can't go wrong. Always use fresh charcoal because charcoal will absorb moisture - if you've kept it over the winter it will get damp, it will be difficult to light and simply won't get up to temperature. If for whatever reason the coals don't light well, do not be tempted to add more lighter fuel or blow on the coals. If you do, you're risking your own health and safety and those around you. When grilling, barbecue flavour is derived from rendering the fat in the food dripping onto the coals, vapourising and creating smoke which imparts the flavour. The principle is the same whether the fat drips onto lumpwood charcoal, briquettes, flame tamers or lava rocks is of little relevance. A more significant factor is whether you have the lid on or off. Read more on the pros and cons of charcoal versus gas. Use the following guide for the basics of cooking so that things happen as you plan. For more information use my section on how to grill. Plan your cookout - think about what needs to be ready and when. If it's too much pressure, take the Tapas approach and do small quantities of lots of different things. Always start charcoal grilling on the highest height setting to avoid flames. 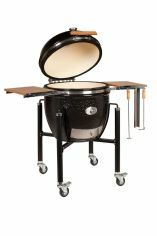 For gas grills get the lava bricks / flame tamers and then turn the gas down before adding food to the grates. Food cooks with heat, not flames. Flames are BAD! 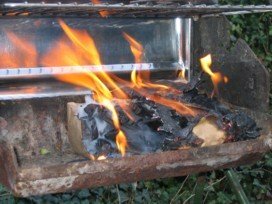 If you do get flames either take the food off, raise the grill height, close the lid, dampen down with a water spray or turn the gas regulator down. All of the above will have an effect to a differing degree. When doing kebabs on wooden skewers remember to allow at least 30 minutes for soaking the skewers. If you don't soak them you risk them burning and disintegrating. Choose your meat dependent on what you want to cook. If you are grilling then it must be a tender cut, save the tougher nuts for indirect cooking or smoking. A barbecue marinade will add flavour and tenderize but only to a small degree, don't expect to marinade and notoriously tough cut and expect a marinade to sort your problems. A Teflon® Barbecue Mat will keep your vegetarian food "meat free" and also stops patties sticking to the grill and disintegrating. Here are some basic barbecue tips to get you going, once you've started to learn the art, there's a lot more detail and you'll find all the information you need in the links below. Similar rules of patience apply when smoking because the smoke generated in the initial burn phase of wood or charcoal is thick white in colour and bitter to the taste. You want to get through this burn phase and wait for the blue wispy smoke before adding meat to the food chamber. Once your ready to cook use this article to learn about how to control the temperature of your smoker by varying the apertures on the air vents. Click on this link for my full smoker instruction manual about the cooking process. The principle is effectively the same as cooking in an oven in that the food is not in direct contact with the heat source the only differences are that typically cooking temperature is lower than you would use in a conventional oven and smoke is passing through. Cleaning techniques depend on the material from which your grill grates have been manufactured. If you're grill grates have gone rusty then you're not going to win. You tend to find that rust forms on cheap stainless steel or chrome plated grill grates especially if your grill is left out in all weathers. No matter how much you scrape off rust will continue to spread and you risk metallic debris in your food. This is why we make good quality stainless steel cooking grates that never rust. When grilling or smoking it's not just about barbecue tips, check out these food preparations tips that will help make your cookouts go that much smoother.